Daniel Gray, a Seoul Eats food blogger, recently published an op-ed in the Korea Herald regarding the public and private efforts to export Korean culture to the West—particularly to the United States. With coverage from the New York Times, CNN, and other high profile news organizations in the US, the government seems to be doing a fair job of gaining the attention of Western eyes, and now is focusing on making Korean food America’s Next Top Asian Cuisine. Take the full page “Bibimbap” advertisement that was in the New York Times on Dec. 21. First of all, I applaud the Korean show “Infinite Challenge” for the initiative. The ad had a great headline: “How about Bibimbap for lunch today?” There was a gorgeous picture and they gave the phone numbers of several Korean restaurants in New York. First of all, death (customers of memorial service) doesn’t arouse my appetite and non-Korean speakers will not know what “namul” is. It was a great idea, just poor execution. The way that Koreans market Korean food for Koreans will not work overseas. Korea’s “four seasons,” “well-being,” “good-for-health,” “kimchi,” and the “5 colors” will not convince the average person to try Korean food. Awkward language aside, this ad is problematic for more reasons that Gray’s analysis reveals. Gray claims that the primary reason certain Korean foods will not catch on in the states and elsewhere is the taste and textures of the foods. It is true that some cultures are naturally more open to certain foods than others. For example, Gray writes about a series of interviews his company, O’ngo Food Communications, did with foreigners regarding their favorite Korean foods. His research, apparently “found that many French people liked chicken and ginseng soup. They said it reminded them of a popular French dish: poule au pot.” Gray believes that these results lead to the obvious conclusion that certain foods export across cultures better than others. While that may certainly be true, it is a myopic analysis that isolates food from the larger context of the food’s cultural origin. The problem is not exclusively a taste issue, though that is certainly part, and cultural differences do determine what tastes “good” to people. So far, Korea has failed to recognize how their culture fits within another culture. That is, more than anything else, Korean companies have a rhetorical problem, not an attracting people into restaurants problem. He [Gray] is posing the question to [those] who already understand the government’s romanization system. However, the overwhelming percentage of the world’s non-Korean population is NOT familiar with this system, which, naturally, has certain quirks. The Korean language has many quirks, and its alphabet is equally idiosyncratic. In May 1972 Richard Rutt in the Korea Journal called Korean “a singularly intractable language for romanizing.” Rutt attributes this mostly to the “excellence” of the Korean alphabet, Hangul. The alphabet was designed in 1440 by King Sejong as a way of allowing the people to learn how to read and write their own language. Though scholars like Ki-Moon Lee in The Korean Alphabet, edited by Young-Ki Kim-Renaud, suggest that Sejong invented Hangul in a more Edisonian fashion—with Sejong as the mastermind and many people working around him, the official record claims he did it entirely by himself. Prior to Hangul’s invention Koreans used Chinese characters to represent their language, which meant that like Chinese, Koreans needed to memorize thousands of complicated, individual characters, their stroke order, and the words they represent. Sejong decided it was time the Koreans had a system for reading and writing that matched the nature of the unique Korean language. According to the Korean government, Sejong invented the language “to contribute to a better life for the sake of ordinary people.” Since its creation, this alphabet for the people has been hailed as the world’s most scientific lettering system and the first alphabet intentionally created for a specific language. Since Sejong’s time, Hangul has proliferated across the peninsula. After overcoming resistance from the nobility, who saw hangul as a threat to their power, it eventually became the prominent and only way of writing the Korean language. During their occupation, the Japanese unsuccessfully attempted to wipe out Hangul completely. Despite these uphill battles, it is hard to envision modern Korea without Hangul. If the peculiarities of the Korean language can account for what drove the adoption of Hangul over the insufficient Chinese characters (known as Hanja), they are what historically have driven discussions over romanization. Over the years many different systems for transliterating the language to the Roman alphabet have been adopted. Rutt covered the progression of romanization standards, and suggested that the systems devised by Yale and McCune-Reischauer are the best systems, but also that there may not be a perfect way of transliterating the language. Even with a standardized system there are still significant problems with the 2002 revision. Indeed, if one looks at other Asian languages, the romanization methods are far from perfect and more an approximation of how to speak the language than an exact guide. For example, the way most Americans pronounce Seoul is far from the proper Korean pronunciation. The best way to accurately pronounce Korean words is obviously to learn to read Hangul itself, a task far less daunting than it sounds. This is why Salmon’s argument that “if Korea needs to communicate an unfamiliar product to global audience, it needs to: (a) Make the English reflective of the Korean original” doesn’t hold much weight. Though Salmon is right in that Korean words are difficult to pronounce, a more familiar spelling is not likely what will get people buying Korean food. If the Korean government and the Korean people are serious about exporting their food, they need to remove the blinders and think beyond their own borders. Gray is likewise correct when he writes about how terrible the Bibimbap advertisement in the New York Times was, but it is not just because death does not arouse an appetite in, at least, Americans. It is because death, dying, and funerals are not thought of in the same way in American culture as they are in Korean culture. In the US there is a funeral ritual, and the deceased are respected and honored, but Korean culture has a totally different set of cultural properties associated with death and the dead. Americans do not, for example, have a three day holiday dedicated to paying homage to ancestors as Koreans do—Chuseok. There are no rules about serving food to dead people, nor are there colors in which we may not write someone’s name without casting a death wish upon them. It may be the case that bibimbap has a history of being food served to “customers of memorial services,” but in the U.S. funeral food is not exactly a culinary delicacy. In addition, in modern Korea the rice and veggie “casserole” is everywhere, and there are plenty of ways to market it to Americans. It’s a hearty bowl of rice, whatever vegetables are around, and a special sauce that makes it just spicy enough to give it some kick. It’s a meal that’s perfect for “carbing up” before a run or hike. This is not to say that Seoul should surrender Korean values and tradition in order for its products to cross the Pacific. If Seoul is serious about selling Bibimbap—or any other Korean food—to Americans, however, it must meet Americans on their turf. Seoul needs to show Americans what they’ve been missing; how Korean food fits into the existing culture in the United States. This is hardly a new idea. When American companies export their products overseas, it comes with adjustments for the local culture. McDonalds for example, (it’s worth noting here that a commentator on Seoul Eats made a similar argument) sells products in nearly every country in which it exists that are simply unavailable in the US—Curry Chicken McNuggets in China, bulgogi burgers in Korea, and beer in parts of Europe. It is no surprise then, that McDonalds is wildly successful in Korea and other countries around the world. If Seoul does not account for other local traditions and culture when attempting to globalize their food, it simply will not work. It is obvious to many foreigners living in Korea that Koreans have a great deal of pride in their language, culture, and country. To see a country the size of Indiana set such an ambitious goal as to export their food all over the world is truly admirable. Seoul must change its strategy to realize this goal, however. The Korean government and private companies must target specific groups of Americans and determine what will cause them to add their neighborhood Korean restaurant to the list of places they frequent. Korean food already fits into the melting pot of the United States. While some foods are totally foreign to American tongues, a lot of Korean food is similar to other Asian cuisines. Mandoo is nearly the same as Chinese dumplings, or wontons, and the noodle soups are similar to Chinese noodle soups that are already popular. A staple of Korean dining, the banchan are essentially side dishes, something Americans already know, love, and will even pay a premium to eat. Americans love grilling, and they love drinking while doing it—give them a restaurant in which they can do both, in a foreign and exotic environment, and you can play to American ideas of being worldly and cultured while engaging them in something familiar, something with which they can already identify. There is definitely a place for Korean barbecue in the United States, there is a place for tteokbokki, bibimbap, kalguksu, and there is a huge place for banchan and makgeolli, but Americans do not know it yet. One of the best ways to promote Korean food in American culture might be to use the million or so foreigners in Korea to promote Korean food in their homelands. Maybe Seoul could set up a system offering grants, loans, or support to teachers who want to start up a Korean restaurant once they return home. As evidenced by the quantity and content of food blogs in Korea, there are many foreigners with strong opinions about Korean food. They are already semi-experts on Korean food—or at least more so than anyone else in the US—and they are also experts on the culture of their homeland, thus making them perfect candidates for promoting and selling Korean food and culture to the masses. There are foreigners living in Korea who love Korean food. Some avoid it, but the majority are likely somewhere in the middle, with a few favorite dishes, and a few dishes they rarely touch. The best thing Seoul could do to promote Korean food is to get the foreigners into Korean restaurants upon repatriation, and to bring their friends and money with them. The bottom line is that food, like other parts of culture, is an idea unique to that culture. When it comes down to it, Seoul’s goal is rhetorical. It is about finding a way for Americans to identify with Korean food. Gray, Daniel. “How Not To Globalize Korean Food,” Seoul Eats. 02 February 2010. http://www.seouleats.com/2010/02/how-not-to-globalize-korean-food.html accessed 5 May 2010. Gray, Daniel. “Food For Thought, Misconceptions About Food Bloggers and About Seoul Eats” Seoul Eats. 21 February 2010.http://www.seouleats.com/2010/02/food-for-thought-misconceptions-about.html accessed 5 May 2010. Salmon, Andrew. 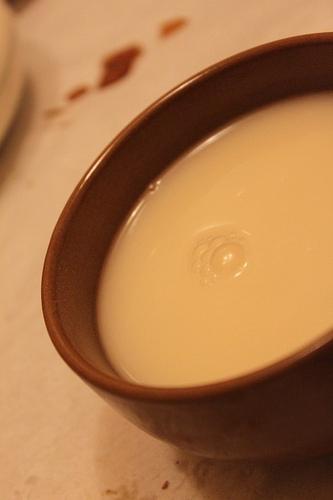 “The Makgeolli/Makkoli Debate,” ZenKimchi. 4 February 2010. http://www.zenkimchi.com/FoodJournal/archives/2426 accessed 5 May 2010. Lee, Ki-Moon. “The Inventor of the Korean Alphabet,” The Korean Alphabet: Its History and Structure. Kim-Renaud, Young-Ki ed. 1997 University of Hawai’i Press. Honolulu. National Institute of Korean Language. “Want to Know about Hangeul?” January 2008 http://www.korean.go.kr/eng_hangeul/ Accessed May 2010. Seoul. Quigley, Brooke L., “‘Identification’ As a Key Term in Burke’s Rhetorical Theory,” American Communication Journal. Vol. 1, Issue 3, May 1998. Accessed online: http://www.acjournal.org/holdings/vol1/iss3/burke/quigley.html 5 May 2010. I’ll return to this post tomorrow, but at least two things make me doubt the accuracy of it..
1) “certain foods export across cultures better than others. While that may certainly be true, it is a myopic analysis that isolates food from the larger context of the food’s cultural origin.” is a deal-breaker. Dan is talking about the food in a foreign culture and if you admit that his point is true and THEN try to address the food’s “cultural origin” you are indulging in the error that the Korean International Food Marketers do. They think of cultural origin, not the culture to which the food is introduced. This is marketing fail Number One. LOL… “export” works in the landing country, not the weird fantasies of the exporting one..
2) Salmon’s “point” about interviewing those who “know” how hangul sounds being a bad approach? That’s insane. These are people who know the pronunciation in BOTH languages.. consequently they might be able to figure out how the sounds of hangul would translate into the sounds of English. The concluding points, which don’t seem to be coated in animus, are right on. I mean.. how could properly marketed BBQ not work? And all the theoretical palaver about the Rhetoric of Motives? Sure.. and the other great thing about BBQ is that it does cut through theoretical crap and bring us all together at a communal table. And this is particularly true of Korean BBQ. This harmsboone post strains mightily under its own weight.